We are proud and glad to present Bolt 3.0.0 stable to you, today. A lot has changed in Bolt 3, both under-the-hood as well as from a visual perspective and there are quite a few new features too. Bolt 3 has matured, and grown into a very extensible tool, that can be used both as a straightforward CMS, as well as a platform to build your custom applications on. The default installation of Bolt is now a pre-packaged composer installation. In practice this means you can simply download a .tar.gz or .zip file to get started, and keep that updated by simply renaming one file, and running composer update. We provide a bunch of other installation options too, like 'composer installs', 'regular FTP', 'cloning from git'. As an added benefit, the default installation now keeps all PHP and configuration files outside of the webroot. We dropped support for PHP 5.3, and fully support PHP 7.x. Bolt 3 requires a minimum PHP version of 5.5.9. We're following suit with the underlying components we use, like the Symfony Framework. We've refactored the Database storage layer. Going forward this will allow us to provide more specific and specialized functionality, like fine-grained caching and more efficient complex queries. Right now, it already allows for some of the improvements in the Extensions layer and the Repeater Fields. Bolt 3 has a brand new extension layer, with a large focus on making Bolt's use as a framework much more powerful and developer friendly. It is important to note that version 2 extensions will not work with version 3, but for most extensions the work to port them to Bolt 3 should be straightforward and well documented. You've always been able to specify your own content-types in extensions, but Bolt 3 adds to that. When using Repeater fields, you basically define a block of fields that can be added to a page multiple times, as needed. Together with the revamped template-fields, this allows for more fine-grained control over your contenttype definitions. The Backend user interface had a bunch of touch-ups. A more thorough redesign will come later this year, and this release lays the foundation for that. In both in templates and extensions, you can now make use of widgets: Self-contained pieces of code, that provide a specific functionality. 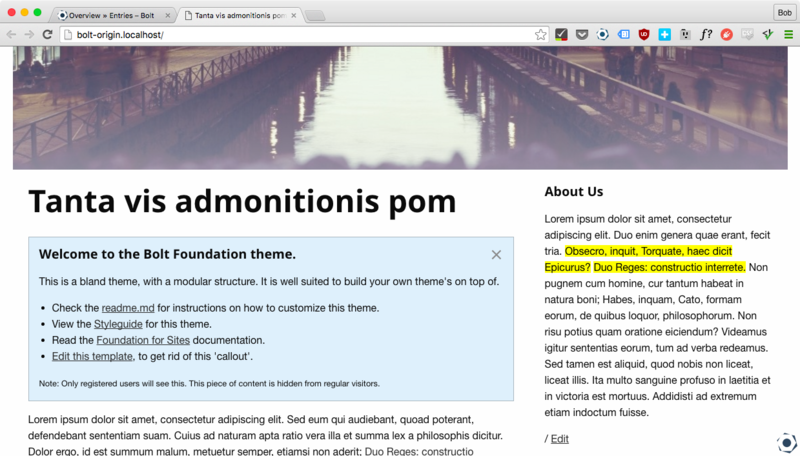 Extensions can now add widgets, both in the front- as well as in the backend. This allows extension developers to provide components that can be used in different templates and for different usecases. Bolt 3 has a new base theme, that is very tinker-friendly: You can tweak a few colors in the css, restructure the entire thing, or anything in between. We've done a lot of work on the documentation for Bolt. Installation, configuration, theming, as well a lot docs describing how to build extensions for Bolt. …a bunch of other features. We've refactored sessions and we've improved tests / code coverage as well as JavaScipt backend code. Finally, we've added a New controller & routing layer. All of these were built with flexibility and extensibility in mind. Further enhancing and optimizing the codebase. For greater reliability, flexibility and extensibility. For example, we'll be moving to Silex 2 and Symfony 3, and even more of the components we use and maintain will become extensible or even replaceable. Re-designing the Bolt backend, so it becomes sleeker and at the same time more intuitive. The Bolt Backend is pretty straighforward, and Editors can easily find their way in it. That said, we're planning on overhauling it to make it even more appealing to editors and developers alike. Growing the community further, to get even more people involved in the ongoing development of Bolt itself, as well as the thriving ecosystem of extensions and themes. Currently, we have a community of enthousiast users and contributors, but we plan on growing the community even more. Like your grandma used to say: The more, the merrier. Solidifying the development cycle, to provide for more frequent releases, with less impact to the users. Bolt 3 lays the foundation for that with the new structure, and the way it's easy to upgrade. For manual installations, get the distribution files here: bolt-latest.tar.gz or bolt-latest.zip. If you're updating from a beta release of Bolt 3, simply run composer update, to get the latest and greatest. Or check the page on Upgrading for more detail.